This collection of pieces, Anaitalrax, is described as “25 virtuosic piano studies… in the spirit and mood of Domenico Scarlatti.” The Solaire label can be counted on for extensive and well-written booklet notes and this is no exception, with commentary and anecdote from the composer's wife, by pianist Ralph van Raat, and an extensive essay by Tobias Fischer. Erik Lotichius is by no means a household name even in the Netherlands. His music was largely ignored during times when the avant-garde was in the cultural driving seat and conventional tonality was viewed by many as a capital sin, but later life saw a sea-change in his career. A number of titles on the Brilliant Classics label provide further listening (review). Lotichius started out with ambitions as a pianist, and the pieces in this recording are infused with influences from the past. Bartók is highly significant in this regard, and the stylistic use of jazz combined with a deeply honed quality of classical craftsmanship results in work that is at the same time instantly accessible and 'familiar', while projecting freshness and a stimulating amount of the unexpected. There is a Romantic foundation here too, though this never relapses into easy sentimentality. There are few if any 'earworm' melodies, though there is no shortage of lyricism. The question is put as to whether Lotichius was a man out of his time, but this should really be more of a statement on the lines of Lotichius as a composer who refused to conform to trends or 'isms'. The use of jazz rhythms and chords arise as essential tools of expression, as do some minimalist passages and those dissonances that integrated Bartók's use of folk music into his own sphere of sophistication. The jazz and dance music touches in something like No. 7 are those that one encounters in a composer like Martinů: put to the service of a composer with serious intent, but also one with a 'twinkle in his eyes.' Minimalist passages emerge as sequences but are not repeated and developed in a minimalist fashion. Lotichius was aware of American composers in this genre, but it is more his fellow Dutchman Simeon ten Holt whose colours shine through onto the scores like occasional moments spotlit through a stained-glass window. You can trace a more expansive adventurousness in this regard with the later pieces. All of these are titled only with their tempo indication, and some have an additional dedication to someone significant in Lotichius's life. The umbrella title Anaitalrax is part of a series of names whose enigmatic appearance is reduced when read backwards. The genesis of the Anaitalrax studies goes way back to Lotichius's first significant piano lessons, and a love for Scarlatti ignited by a demonstration by his teacher Wouter van der Berg. Scarlatti is a kind of starting point, a springboard for works that are by no means in imitation of his style, the "spirit and mood" being that of free and vivacious invention within chosen frameworks, and certainly a vehicle for expression that developed and changed after its initial impetus. Composed over a 30 year period and with none of the pressures of commissioned work, these pieces are "playful and explorative, profound yet humorous... we don't hear the most personal emotions nor the most complex compositional concepts of the composer. What we do hear is the full range of his passions, the sum and total of his influences and his entirely recognisable way of making them his own." Ralph van Raat originally recorded some of Anaitalrax in 2001, and his affinity with these pieces leaps out of your speakers from the start. His virtuosity is unclouded by haste and uncalled for extremes of display, and the music has more than enough content to speak for itself. 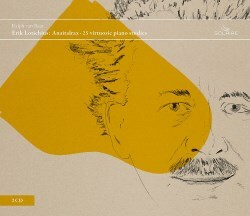 In the booklet, producer Dirk Fischer talks us through the interesting challenge of setting up a recording of music that has little or no performance tradition, but van Raat's colourful playing is captured superbly and the whole thing is yet another demonstration-class production, fully in agreement with Fischer's final philosophy that, in the end, it is the music that counts above all technical considerations. ...and in the end, Erik Lotichius's music is the kind of thing about which it is better to just listen rather than to talk endlessly. I think you'll rather enjoy it.